Offers an easy, effective way to control and prevent the growth of algae. Leaves pond water crystal clear. 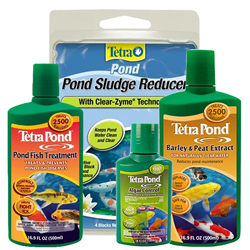 Helps keep pond clear from algae when used regularly. Pond block is not recommended for ponds with plants. For best results, place the block in an area of the pond that is calm. Water Clarifier quickly clumps contaminants so they can be easily removed by filtration. Will not harm pond life and plants (when used as directed). Dilute the proper dosage in a bucket of water. Pour the diluted mixture into the pond evenly along the edges and in the middle. Stir the water with hose spray or stick to further distribute the solution throughout the pond. Provide continuous aeration to the pond with fountain, waterfall or air pump while using this product. Remove clumps of contaminants from pond bottom with a fine mesh net or pond vacuum. Pond filters will also remove some of the debris. Re-dose as required, allowing 3 days between treatments using 1/2 dosage. 10 ml for every 100 gallons of pond water. When using this product, Carbonate Hardness should be maintained at a level greater than or equal to 1-2 DH. If in doubt about your water's hardness, perform a 20% water change. Be sure to use AquaSafe water conditioner any time you add water to the pond. Do not use more frequently than every 3 days to avoid excessively stressing the fish. Provide adequate aeration. Treat in the morning for the best results. Fountain block helps clear cloudy water and remove algae from ornamental pond/fountain water. Fountain block is limited for use in backyard/homeowner ponds and water fountains. Not recommended for use with live plants.